Finding the perfect combination of quality, durability, comfort, and price is many times an ordeal. Given the large number of products available in the market today, all promising to give you the best deal, the search becomes daunting. We want to make your search for the perfect wader a lot less daunting and narrow it down to the top duck-hunting and water-hunting waders for the money in 2019. These are the best at what they do and we have classified them by the activity you will be performing because a great hunting is influenced by a great wader. Great For Any Spotting Scope Activity. Ergonomic Design And Durable Body. Long Range Scope With Great Optics. Not only is this our most affordable selection but the Hodgman Caster Neoprene is one of the best duck-hunting waders out there. It is actually amazing how the manufacturer was able to put together a wader with all the features it has for the price. This is one of the best waders for duck hunting, and at the price it sells, you will see why it’s a steal. It features a top loading pocket that doubles as a hand warmer and is made of soft fleece. It offers protection to your knees and calves, through reinforced double-layer knees. Its durability and resistance come from the 3.5 mm neoprene shell which also contribute to its flexibility. To offer you comfort and safety, the Y-back elastic suspenders strap with opposing buckles. There you find D-rings, hanging from this strap. This wader is recommended if you are going to be hunting at a temperature that goes by the 30s and 40s since it will keep you warm. Strong chemical odor makes them impossible to use right out of the box. Does not fit as expected (larger than usual). The print is not camo. When you open the package, you will feel a strong petroleum smell, which is from the chemical they use to ensure waterproofing. You will have to air them for at least 48 hours before using them. But then, that should be only one time. The size has been reported to be one number bigger than expected so you might want to consider that before purchasing. But then, you will find out once you put them on, that they are actually very comfortable and warm enough for your duck-hunting trips. We love the price and the quality this wader provides. It is completely waterproof and does not wear easily. It is sufficiently padded and it has all the elements of a comfortable wader. The Allen Cattal Bootfoot Neoprene chest waders are not only functional but they also fit so comfortably well. These easily adjustable Nylon knit Mossy Oak Blades camo jersey material laminated waders will keep you dry and make you forget you even have them on. These waders were designed to fit great and to be functional. The design consisting of a high back and mid-level front makes it easy for women to use it. The rubber boots are made with Thinsulate and with a semi-hard toe cap. These boots even have a steel arch support. As we said, they are designed for comfort. To keep adding to the comfort and fit, the adjustable suspenders feature a D-ring attached to the base in order for you to attach stuff on it. Other great features include a belt, a hand warmer, and padded knees. It keeps you warm in very low temperatures but it is pretty breathable in more average weather. The insulated rubber boots include a steel arch support. The waders tend to feel too hot in warmer weather. So keep that in mind when you get yours. Some users have reported that the size is bigger than expected. However, they have made them work just great and have lasted for at least three seasons. Unlike most waders, these ones include boots with a steel arch support, which makes you walk comfortably even if it is only while in the water. The fact that they will fit perfectly tells you of the comfort and warmth that you will get with the Allen Cattail Boot foot. If you are looking for affordable and super durable camo waders, this is the place to go. These have the perfect combination of neoprene and Thinsulate to make them a good choice for moderate to semi-cold weather. These are not our cheapest option but it is the best one for the price, a still good one. The Allen Big Timber Bootfoot waders have the unique design of a higher back, which makes them work great if you are going deeper into the water. It is made from 3.50 mm of neoprene plus the boots are made with 600 g of Thinsulate. The waders include loops for the belt, which make a great fit. The high back design includes adjustable suspenders that can be easily adjusted. The adjustable web suspenders feature a D-ring to make it more functional. The rubber boots also include a semi-hard toe cap and steel arch. It comes with a waist belt. If you are looking for extremely cold temperatures, these waders will not work for you. Lucky for us, duck-hunting is not likely to happen in such extreme weather. The fact that the product is light mostly obeys to it being thin. Just make sure you don’t hit anything too sharp and you should be fine. We would recommend these waders to anyone. They are comfortable, completely waterproof, light (which helps move around), and the grip on the boots is just great. These waders have a couple of characteristics that make them unique and a certainly good acquisition. These are not your typical “you get what you pay for”. You will be surprised about its performance and even more when you see the price tag they come with. The manufacturer has priced these waders especially low. But that does not mean that they will not perform the same as their more expensive counterparts. Probably the first thing you will notice is that they are a lot lighter than rubber waders. The waders are made of nylon and the boots are elaborated with PVC, which is more durable than rubber. Their large size guarantees greater flexibility, which means it is easier to walk with them. The fact that they are bit big helps make them more comfortable and not tight at the armpits or crotch, which is the case with many waders. Boots are made of PVC. Not good for cold weather. You must note that you will probably get a size that seems too big. However, in most cases, once you walk them out, there should not be a problem at all. We like the light weight and the simple adjustable suspenders. The boots are durable and able to endure all types of terrain. People love these waders thanks to its durability and strength. The neoprene shell is what makes them last for several seasons. Pretty much everything in these waders was made for durability. One of the best on the market when it comes to Waterfowl Waders. The upper, which is especially high, features a 3.5 mm neoprene upper. This tells you about durability and warmth. The waders are capable of withstanding harsh weather conditions. Speaking of durability, you will notice that the seams are stitched, glued, and taped. This will keep the water inside and decreases the chances of water coming in anytime soon. It comes with neoprene adjustable suspenders which help for a better fit. This ensures that these will always sit comfortably on you while doing your waterfowl hunting. The rubber boots come with 600 gram Thinsulate ultra insulation. This ensures that your feet stay warm and comfy even in conditions of low temperature. Take them anywhere and under the coldest weather-you do not have to worry about a cold core anymore. It might fit small on some people. For some reason, Frogg decided to use Velcro for the straps. This limits the use of the D-rings since if you hang something too heavy, the Velcro straps will just come off. However, you are still getting a great product at a great price. We like all the work put into making these waders especially durable. For the price, we believe these are one of the most valuable sets of waders for waterfowl hunting. They also come with kneepads for puncture protection. The quality that Frogg has us accustomed to is met on this design. The fit is comfortable, even if it seems like they are a bit bigger for your size. Put them to the test and you will see why we consider these our top comfortable choice. Designed to last a long time and to fit comfortably, the Frogg Toggs Men’s Cascade 2 waders come with many of the features you will see on higher-end products. The top is made with ply rubber and 300-denier polyester plus the boots are cleated and made of rubber. Doesn’t feel like your size? Adjustable Velcro straps, H-back suspender, and an adjustable chest draw cord help to a better fit. These waders will keep you dry and clean through many hunting sessions. They are warm but work best on not-too-cold temperatures. The rough poly/rubber manufacture of the wader upper makes them especially durable. The boots are lightly insulated and feature a steel shank. The adjustment straps feature D-rings with a hand-warmer pocket on the chest. There are other details that also make the Men’s Cascades 2 especially durable. The seams are triple-secure, the wool insoles, and the padded straps also add to the comfort. We do not really like Velcro straps because they can come off with little weight. But then they are also easier to adjust. The upper tends to bag around the chest unless you are huge. We like the value of this product. So many features usually found in more expensive models are all in this one. One thing we love them for is for the extra comfort they add to them. When you think excellent price and great quality, The Canyon II Stockingfoot from Frogg Toggs definitively comes to mind. This wader has everything you need at comes at an unbeatable price. We are sure you will love everything about this breathable chest wader. The Canyon II Stockingfoot are highly durable waders built with tough nylon that allows the manufacturers to guarantee to last for years. To make it fit more comfortably, it features an adjustable elastic belt leash, which is easily adjusted with quick-release buckles. It also features a zippered security chest pocket and 4 mm double-tape neoprene booties which complement this durable wader. The design allows for it to work in conditions of warmer temperature as it allows are to circulate in. The materials seemed a bit lean but once you try it on, you will get your satisfaction. Just try not to beat it that hard as that will definitively reduce its useful life. The design of these waders is basic, simple, and very practical. To this, you add the quality of the material and you get great value for what you pay. Thankfully, the straps are not attached with Velcro but with quick-release buckles which makes it easier to put on and off. An impressive pair of waders that will impress you too. These waders feature a nice set of perks that you will be grateful about. It has the ability to keep you warm during winter but it will not roast you during warmer temperatures as it allows air to circulate through it. Perhaps the one feature you notice on the Compass 360 Deadfall is the large 2-N-1 B.A.P Chest Pocket. It is zippered and waterproof which makes it perfect to store anything you don’t want to get wet. It is made of a durable 4-ply nylon which makes it incredibly non-abrasive. This right here is what makes this one our best selection when it comes to resistance. The shell is built with a combination of DuraTex and titanium, which also help keep your body warm. On the booties, we have 800 g of Thinsulate that will keep your feet from freezing. These boots also feature steel shanks to keep you in balance while you travel through rough terrains. It also features double reinforced knees and shins for a great protection. Speaking of booties, these have been designed to ergonomically fit on your feet. This makes this wader a perfect choice for your hunting activities. It keeps you warm when it needs to and will give you a fresh movement through your hunting trip. Chest Pocket design with zippered storage. As we just mentioned, the top of the waders includes Neoprene shoulder pads, which are comfortable but after wearing them for a while, you will feel sweaty. Not recommended if you do not enjoy that sensation. You can try putting a cloth or a pad between the straps and your cloth. We definitively like the dedication put into making this a perfectly abrasive resistance on these duck hunting waders. The technology is also dedicated to giving you great comfort from the toes to the Neoprene shoulder pads. Here is the “Frogg” going at it again delivering a perfectly breathable wader with great options and useful perks we are sure will delight you. This comfortable wader provides mobility and performance. No matter the weather conditions, these ones will keep you safe and dry. Check for a great combination of comfort, price, and quality. The Canyon Taslan has that and more. These waders were made to make you feel premium comfort. The first thing we are going to point out is what makes these so comfortable. The DriPore2Gen technology helps keep the air circulating inside the wader, giving you a more comfortable and dry sensation, which we believe is very important. This means that you can move around and bout with these ones and never be worried about you getting overheated from hunting movement. The construction, made of breathable nylon keeps water from going inside but it also helps get rid of any sweat accumulation in the inside of the waders. The fabrics that this wader is made of is very durable but it is also comfortable. This is especially great for fishers that will spend a long time standing on the lake. To keep adding to the comfort, the adjustable wading belt and the straps ensure that you have the best experience ever. Breathable fabric that dries sweat. Also useful during bad weather. The neoprene booties will not keep your feet warm enough. You will soon find out that the booties are not insulated enough. If you get into cold waters, you will begin to feel the chill very soon. We recommend wearing socks before getting into the waters. We like that these waders provide comfort, good quality, and an increased performance. The technology put into proactively getting rid of sweat will help you through hot and cold days. These are our best option if you are short on budget. Even though the wading boots are not included, we still consider it a great choice for duck hunting. This wader has interesting features that will actually entice you. These camo waders are comfortable, they keep you dry, and will help you stay warm. They are made of neoprene after all. These waders are stockingfoot, which means that you will need a separate pair of wading boots. But the quality you get for the price of these ones is simply amazing. The waders are made from 3.5 mm neoprene material with a nylon outer layer to prevent abrasion. You also get reinforced knees, a big front pocket which doubles as hand warmers, and D-rings to help you carry stuff. The camouflage is a MAX-5 Realtree camo. Attached gravel guards help reduce the mud and debris that enters your boots. Overall, the quality of this wader is surprisingly good for the price. All the characteristics of a pricier wader. Nylon outer layer to provide abrasion. Wading boots are not included. The neoprene booties could be thicker. We know that these are stockingfoot but we still believe that a thicker layer of neoprene at the feet would have helped feet stay warmer. Other than that, the Waterfowl Wading System is rather impressive. We love all the features that manufacturers were able to put into these waders. All the features needed for wading at very cold temperatures are there. The fact that these waders are so durable obeys to the great combination of fibers used to elaborate it. Depending on the size and type, you can get a lower price. Check out this awesome option by LaCrosse. Made with at least four different types of fibers, the LaCrosse Swamp Tuff Pro is an ode to durability. Leave it to a company that operates since 1879 to put together such a fine piece. The upper is made of 5mm insulating neoprene and is lined with fleece to make it even more comfortable. Extra durability is achieved through a unique combination of spandex and Lycra. The wader uses Realtree MAX-5 camo which makes it strategically suited for marshes, lakes, and anywhere to go for waterfowl hunting. The seams are double-stitched with their Armor Weld seam-sealing technology, which involves stitching, then taping and reinforcing with a coat of rubber. An ankle-lock system keeps your feet in place in case you get stuck in the mud. The pants are complemented with the classic pockets, plus a game bag and a shell pouch. The boots are insulated with 1000G Thinsulate Ultra insulation, meaning that they will keep your feet warm in the harshest cold. Not that we did not expect it but that combination of fibers used to reinforce this wade makes the entire thing heavier than average. This might be an issue when you are trying to get your stuck boot out of the mud. This, however, is solved by the ankle-lock system. Overall, this is a durable choice and is well worth the investment. We like the durability and the amazing features of this wader. Granted, it is the priciest one on our list but you will see how it is truly worth the investment. Still on a budget but looking for the best quality and durability? Frogg has created this fantastic wader built with neoprene to make those large duck hunting adventures. One of the best options on the market that offers the best bang for your buck. To ensure bot a waterproof and warm wader, neoprene stands as the most reliable fabric. This makes the Frogg Toggs Amphib your best choice for a highly valuable wader. This product comes with a 3.5 mm thick bib-style neoprene fabric plus reinforced knee pads that provide maximum comfort and flexibility. The boots are made of 200 g of Thinsulate insulation that ensures warm feet and protection from water. The sewed-in booties made with 3.5-mm neoprene have sliding gravel grounds. The perfect fitting is ensured by suspenders with a hook and loop adjustment. A neoprene pocket helps you store your essentials and keep them protected. A thick layer of neoprene. Great price and high quality make it our best valued. The pocket is not waterproof. Size is larger than expected. Users have reported that the fit is not as expected and it is usually larger. Given this, we suggest you pick a smaller number than your usual. Either way, you can still return it if it does not fit as expected. Frogg also offers an exclusive one-year warranty. This wader is made of neoprene and is great at keeping you both dry and warm. It still manages to be lightweight which means that you will have a great performance while you are in the water either fishing or waterfowl hunting. If you are serious about getting yourself a good budget spotting scope for the money, follow on. Your experience will still be a prime one as you get highly valuable spotting scopes that will not make your wallet suffer. Finding the right spotting scope can be a challenge and not necessarily and inspiring one. Even when you are looking for one that fits your budget, there are so many options that still fall into the category you have filtered in. It is very important to know a thing or two about what you are about to purchase. Not only to prevent a potential scam but to also clearly know what makes you comfortable and happy. As with all things, what probably is a hindrance to some, might be an opportunity for others. Since spotting scopes is what interest us, let us narrow it down to all the things that you should consider before deciding on one. But first, do know that the best spotting scope is the one you are holding right now. You already know your way around it and all the tips and tricks to get it running properly. So we have practically narrowed down what to look for in a spotting scope. Yes, we know that, in the end, it might be all about the budget but that does not mean you get poor quality if you are not exactly carrying deep pockets. A 200-dollar budget will actually get you the best quality, concrete functionality, and a solid foundation. You will probably not be getting the “lavish life” that comes with a high-end scope, but then, again, it must be functional in order for it to be worth the investment. Entry level does not mean it is cheap. 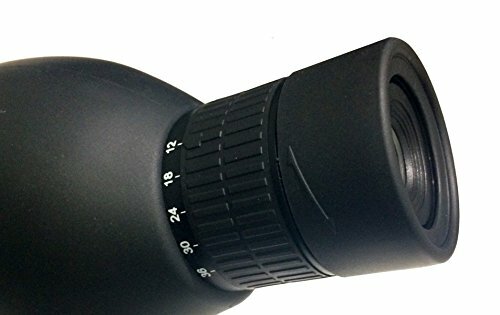 So maybe while you transition to becoming an expert in targeting, you should consider getting yourself a cheap scope and practice and gauge yourself. When the time comes to upgrade you plan for a pricier one. Now, the next thing to bring in is what you are going to be using your scope. Mostly, scopes are designed for a variety of activities but you will get better results if you make a choice based on specific capabilities you will be needing. Magnification is one of the most important aspects you should be looking at when choosing a scope for target shooting. This feature can make a lot of difference in your targeting and hunting results. To get better results, your scope’s power should match your needs. A magnification of 2x-4x is perfect for a range of 150 yards, for instance. If you need a larger range, a 3-9x is great for 300 yards. You also want to look into the eye relief. This is important since considering you will be shooting a rifle, the distance between your eye and the scope should not be less than 2 inches or you can wind up hurting yourself. Hunting is a more demanding activity and there are more aspects that you need to factor in so you might want to take your time here. Now, if you consider a budget spotting scope you must know that you will probably not find all the features you need in one so you will have to decide what is most important to you. These aspects include the type of glass that you need, if you need for it to be waterproof, whether you want it angled or straight, and much more. Most budget-friendly spotting scopes come with BaK-7 glass but if you can stretch a little more, you might want to opt for a BaK-4 lens since these are the ones that deliver a clearer image. If you are still lucky, maybe you can find a budget spotting scope with ED glass, which has the ability to reduce chromatic aberration. If your passion is to take a good close look at nature, you probably want to keep those memories in pictures and/or videos. This is what digiscoping is about. But to produce stunning photos, you need a spotting scope that delivers clear image in HD quality. Hence, your main focus here is clarity. Also, of course, make sure that your spotting scope can have a camera placed on it via an adapter. You should not run into any problem there as most of them have it. But if you do not buy a scope specifically for a particular camera, you will need to get an adapter. Make sure that you have a proper zooming to capture great images with pristine quality. If birding is what you are passionate about, remember to keep a large field of view. More power is not always the best here since greater magnification means that you will need to work on keeping the image steady. But in order to spot birds in their environment, you need a larger field of view. The road here becomes a bit bumpier since long range spotting is done with elements that will basically make the scope pricier. However, manufacturers might give up some other specs to allow you to make long-range spotting with an affordable device. The call here then turns into deciding what are you willing to give up. Watching objects from far away and with a clear image is a luxury. A spotting scope on a budget can provide a range of 100 or even 200 yards. Usually, beyond that, images begin to get fuzzy. When you hit the store, be sure to ask about the best zooming for a better range for a particular spotting scope. We have seen that there are some point factors that you must consider when choosing the best spotting scope for the money. This is crucial since many times what works for you might not work for others. Checking out the best spotting scope under 500 review, might work well for some with a higher budget. The first thing to take into account would be your budget. Once you have established that, decide what is the activity you will be using your scope for. Most scopes are built to perform in more than one environment, however we highly suggest you invest in a tripod, which you can check it out here the best rated spotting scope tripod review. Always be informed in order to make an educated decision. This will make the difference between having a scope for only a couple of years and having one for a lifetime. We want to make your search for the perfect wader a lot less daunting and narrow it down to the top duck-hunting and water-hunting waders for the money in 2018. They are the best at what they do and we have classified them by the activity you will be performing because a great hunting is influenced by a great wader. The perfect combination of functionality and comfort, these waders will give you the flexibility you need when performing in the water. The features on this wader make your investment worth your while. It comes with an impressive number of features given the price. With a combination of DuraTex and titanium, not only these waders keep your sweat out but they also provide the warmth you need when you are in cold weather. Not only is this our most affordable selection but the Hodgman Caster Neoprene is one of the best duck-hunting waders out there. It is actually amazing how the manufacturer was able to put together a wader with all the features it has for the price. Padded knee for calf and knee protection. to use right out of the box. We love the price and the quality this wader provides. It is completely waterproof and does not break easily. It is sufficiently padded and it has all the elements of a comfortable wader. This is one of the best waders for duck hunting, and at the price it sells, you will see why it’s a steal. It features a top loading pocket that doubles as a hand warmer and is made of soft fleece. It offers protection to your knees and calves, through reinforced double-layer knees. Its durability and resistance come from the 3.5 mm neoprene shell which also contribute to its flexibility. The Allen Cattal Bootfoot Neoprene chest waders are not only functional but they also fit so comfortably well. These easily adjustable Nylon knit Mossy Oak Blades camo jersey material laminated waders will keep you dry and make you forget you even have them on. Thinsulate rubber boots include a steel arch support. They do not perform well at hotter temperatures. If you are looking for affordable and super durable camo waders, this is the place to go. These have the perfect combination of neoprene and Thinsulate to make them a good choice for moderate to semi-cold weather. These are not our cheapest option but it is the best one for the price, a still good one. Good for light and semi-cold weather. Great boot grip (come with steel arch). Not appropriate for extremely cold weather. When you look for the top waterfowl waders, you are looking for a product that will keep you dry and warm. Most of the waterfowl hunting happens during fall and winter, so you need waders that will keep you going through thick. Check out our selection of the best three waterfowl waders. These waders have a couple of characteristics that make them unique and a certainly good acquisition. These are not your typical “you get what you pay for”. You will be surprised about its performance and even more when you see the price tag they come with. The manufacturer has priced these waders especially low. But that does not mean that they will not perform the same as their more expensive counterparts. Probably the first thing you will notice is that they are a lot lighter than rubber waders. The waders are made of nylon and the boots are elaborated with PVC, which is more durable than rubber. People love these waders thanks to its durability and strength. The neoprene shell is what makes them last for several seasons. Pretty much everything in these waders was made for it not to break easily. The upper, which is especially high, features a 3.5 mm neoprene upper. This tells you about durability and warmth. The waders are capable of withstanding harsh weather conditions. Speaking of durability, you will notice that the seams are stitched, glued, and taped. This will keep the water inside and decreases the chances of water coming in anytime soon. It comes with neoprene adjustable suspenders which help for a better fit. This ensures that these will always sit comfortably on you while doing your waterfowl hunting. The rubber boots come with 600 gram Thinsulate ultra insulation. This ensures that your feet stay warm and comfy even in conditions of low temperature. Take them anywhere and under the coldest weather-you do not have to worry about a cold core anymore. The quality that Frogg has us accustomed to is met on this design. The fit is comfortable, even if it seems like they are a bit bigger for your size. Put them to the test and you will see why we consider these our top comfortable choice. Construction is not too sturdy. Designed to last a long time and to fit comfortably, the Frogg Toggs Men's Cascade 2 waders come with many of the features you will see on higher-end products. The top is made with ply rubber and 300-denier polyester plus the boots are cleated and made of rubber. Doesn't feel like your size? Adjustable Velcro straps, H-back suspender, and an adjustable chest draw cord help to a better fit. When the temperature gets too high in the outside, the inside can get hotter. Not all products that claim to be breathable actually are. We have found three products that make a real run for your money when it comes to breathability. When you think excellent price and great quality, The Canyon II Stockingfoot from Frogg Toggs definitively comes to mind. This wader has everything you need at comes at an unbeatable price. We are sure you will love everything about these ones. The material might seem a bit lean. An impressive pair that is in to impress you too. These waders feature a nice set of perks that you will be grateful about. It has the ability to keep you warm during winter but it will not roast you during warmer temperatures as it allows air to circulate through it. We did not find any. Perhaps the one feature you notice on the Compass 360 Deadfall is the large 2-N-1 B.A.P Chest Pocket. It is zippered and waterproof which makes it perfect to store anything you don’t want to get wet. It is made of a durable 4-ply nylon which makes it incredibly non-abrasive. This right here is what makes this one our best selection when it comes to resistance. The shell is built with a combination of DuraTex and titanium, which also help keep your body warm. On the booties, we have 800 g of Thinsulate that will keep your feet from freezing. These boots also feature steel shanks to keep you in balance while you travel through rough terrains. It also features double reinforced knees and shins for a great protection. Here is the "Frogg" going at it again delivering a perfectly breathable wader with great options and useful perks we are sure will delight you. This comfortable wader provides mobility and performance. No matter the weather conditions, these ones will keep you safe and dry. Check for a great combination of comfort, price, and quality. The Canyon Taslan has that and more. These waders were made to make you feel premium comfort. The first thing we are going to point out is what makes these so comfortable. The DriPore2Gen technology helps keep the air circulating inside the wader, giving you a more comfortable and dry sensation, which we believe is very important. Neoprene waders are built for cold weather. However, not all of them truly deliver when it comes to extreme weather. But we have selected top 3 Neoprene waders for whenever you have to go fishing or duck hunting when the water is icy cold. These are our best option if you are short on budget. 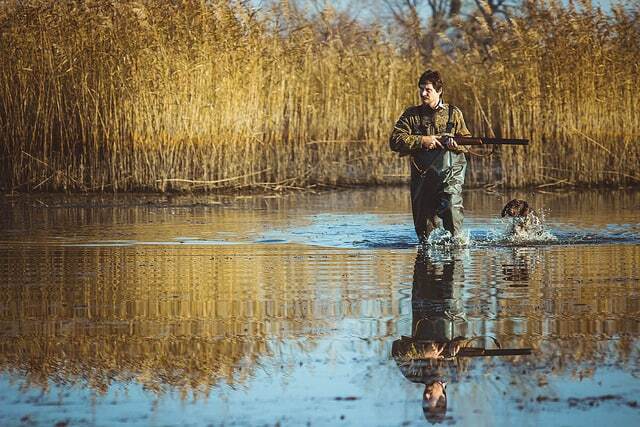 Even though the wading boots are not included, we still consider it a great choice for duck hunting. This wader has interesting features that will actually entice you. These camo waders are comfortable, they keep you dry, and will help you stay warm. They are made of neoprene after all. These waders are stockingfoot, which means that you will need a separate pair of wading boots. But the quality you get for the price of these ones is simply amazing. The fact that these waders are so durable obeys to the great combination of fibers used to elaborate it. Depending on the size and type, you can get a lower price. Check out this awesome option by LaCrosse. Made with at least four different types of fibers, the LaCrosse Swamp Tuff Pro is an ode to durability. Leave it to a company that operates since 1879 to put together such a fine piece. The upper is made of 5mm insulating neoprene and is lined with fleece to make it even more comfortable. Extra durability is achieved through a unique combination of spandex and Lycra. The wader uses Realtree MAX-5 camo which makes it strategically suited for marshes, lakes, and anywhere to go for waterfowl hunting. The seams are double-stitched with their Armor Weld seam-sealing technology, which involves stitching, then taping and reinforcing with a coat of rubber. An ankle-lock system keeps your feet in place in case you get stuck in the mud. The pants are complemented with the classic pockets, plus a game bag and a shell pouch. The boots are insulated with 1000G Thinsulate Ultra insulation, meaning that they will keep your feet warm in the harshest cold. make it our best valued. What is The Best Light Weight Hunting Waders? If you want to have the freedom to move in lighter quality waders, the Allen Big Timber Bootfoot Neoprene Chest Waders definitively your best choice. They are made of neoprene and the boots are insulated, meaning that you will always stay warm even in the coldest temperature. What is the best bootfoot waders? The best boot foot waders are preferred by those fishers or hunters that perform at warmer waters. For that purpose, the Hodgman Caster Neoprene Cleated Bootfoot Chest Waders are our favorite choice and also one of our cheap ones. Of course, it comes with great features that ensure a successful and comfortable hunting. Because of the number of features and the price it comes with, the Frogg Toggs Amphib 3.5mm Neoprene Bootfoot Cleated Wader is our most appreciated product. When tested, this one gave the best feeling of a good investment for a low-priced wader. What is the warmest cold weather waders? Waders made with neoprene are definitively the warmest waders. If the temperature you will be driving yourself is nearly arctic, get yourself the LaCrosse Swamp Tuff Pro 1000g Wader. It is made of several fibers which not only make it comfortably warm but also highly durable. What is the Best chest waders for duck hunting? Not an easy choice but we will go with the Allen Cattail Bootfoot Neoprene Chest Waders. They are great when it comes to comfort, which we believe is important when you are hunting duck or any other waterfowl. As you have seen, a successful hunting party involving you in the water will depend on the type of waders you choose. Keep in mind that the most important factor here is that you feel comfortable in it. Now, of course, this comfort is determined by how warm, breathable, durable, abrasive-resistant, and fit your wader is. You should not settle for something that will not meet your duty on budget. There definitively are durable waders at a very low price that will put a grin on your face.